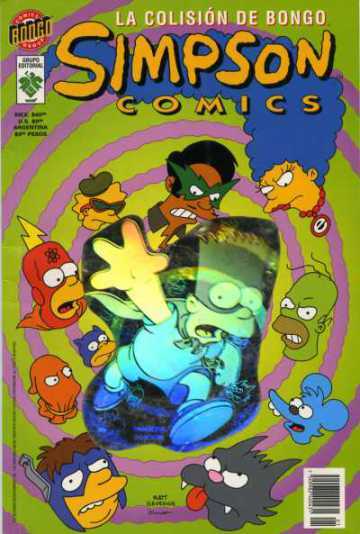 Warning: Display title "'<b>The Simpsons<i> Comics in Argentina</i></b>" overrides earlier display title "<i>The Simpsons</i>&#160;Comics in Argentina". This is a list of The Simpsons Comics in Argentina. Simpsons Comics (Ovni Press) 12 Ongoing The main series based on the US Simpsons Comics. Simpsons Comics (Grupo Editorial Vid) 186 April 15, 1996 August 31, 2011 The main series based on the US Simpsons Comics, Bart Simpson Comics, Bart Simpson's Treehouse of Horror, Bartman, Itchy & Scratchy Comics, Krusty Comics, Lisa Comics and Radioactive Man. Modified on December 19, 2015, at 10:59.